Lieutenant Governor Edison Rijna receives the first 2017 Dive Tag from BMP Manager Wijnand Wolf. 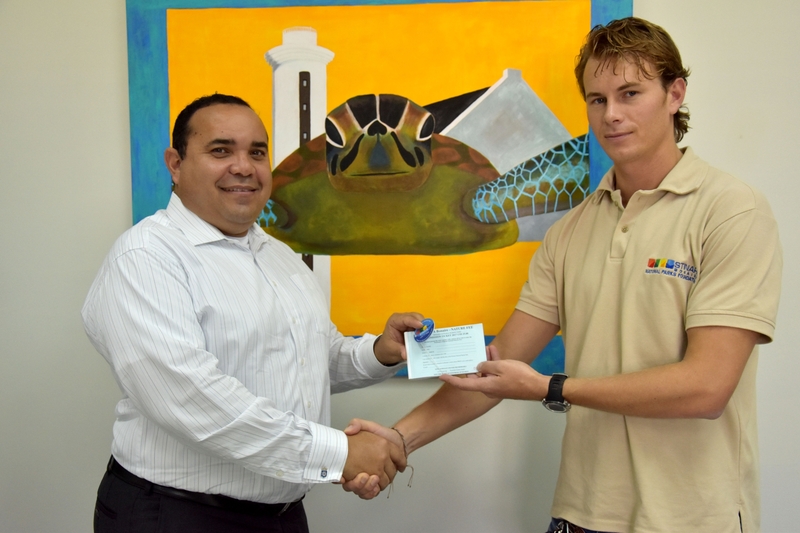 Kralendijk- Lieutenant Governor Edison Rijna has received the first 2017 Dive Tag from the hands of Bonaire Marine Park manager Wijnand Wolf after paying the corresponding fee of 25 dollars. By doing so, the governor is setting the right example. Everyone who makes use of the Marine Park to dive is supposed to pay for the tag. The Dive Tag was introduced in the year 1993 by local government and the current fee is 25 dollars per year.